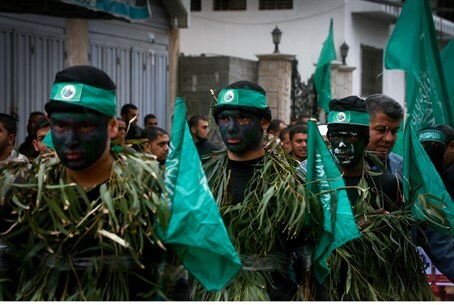 Egyptian court bans Hamas's Al-Qassam Brigades and lists it as a terrorist organization. An Egyptian court on Saturday banned the so-called “military wing” of Hamas and listed it as a terrorist organization, Reuters reported. Hamas is an offshoot of Egypt's Muslim Brotherhood, which authorities in Cairo have also declared a terrorist group and have cracked down on since the army ousted one of its leaders, Mohammed Morsi, from the presidency in 2013. "The court ruled to ban the (Hamas) Qassam Brigades and to list it as a terrorist group," said Judge Mohammed al-Sayid of the special Cairo court which deals with urgent cases, according to Reuters. The case was based on allegations that the Al-Qassam Brigades staged terrorist attacks to support the Brotherhood, and carried out a bombing and shooting operation which killed 33 security personnel in the Sinai Peninsula in October of 2014. The decision comes just days after Egypt's emergency state security court overturned an earlier decision to list Hamas as a terrorist organization, claiming that determining whether or not Hamas is a terror group does not fall under its jurisdiction. Hamas responded angrily to Saturday’s ruling, claiming it would serve Israel. "We reject the Egyptian court's decision against Qassam Brigades. It is a political, dangerous decision that serves only the Zionist occupation," Hamas spokesman Sami Abu Zuhri was quoted by Reuters as having said. A source close to Hamas later signaled the group would no longer accept Egypt as a broker between it and Israel. "After the court's decision Egypt is no longer a mediator in Palestinian-Israeli matters," the source told Reuters. While Morsi’s government was friendly with Hamas, the military-led government that ousted him has cracked down on the group, which it accuses of an attack on Egyptian police headquarters, and of planning church bombings in Sinai. Most recently, Egypt accused Hamas of providing the weapons used by terrorists for two lethal attacks in El-Arish in October, in which dozens of soldiers were killed. Egypt declared a state of emergency in the Sinai following that attack and began to create a buffer zone along the border with Gaza.